What would you say if I told you these truffles were made of only TWO ingredients?! (Well, I guess three if you choose to roll them in cocoa powder, but STILL!) Yep, you can get rich vegan chocolate-y deliciousness with no baking and only two ingredients. What are you waiting for? Happy Monday friends! Did you have a good Super Bowl? 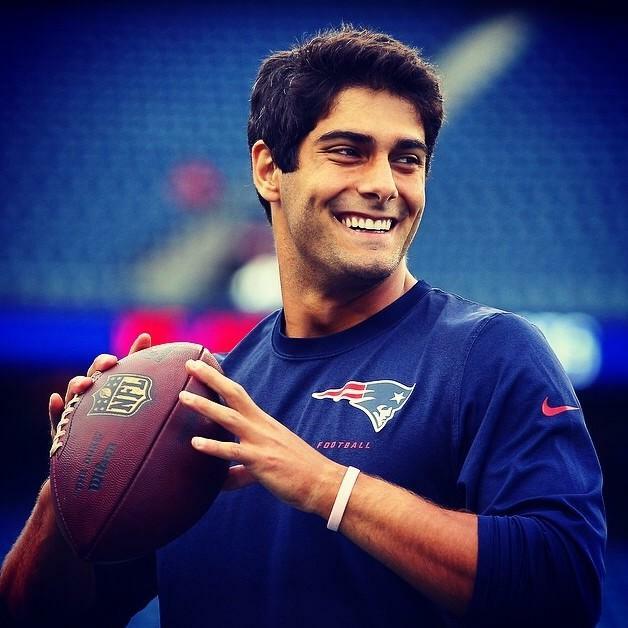 If you're me, you were straining your neck to try to grab glimpses of Jimmy Garoppolo on the sidelines. How are you so pretty?!?! Regardless of where your football allegiances lie, I think we can all agree that the Super Bowl wouldn't be the same without the food, right? So, when my friend Matt said we might be a little low on food at the party we were going to, I sprung into action. I whipped up these two-ingredient truffles as well as some delicious Maple Snickerdoodles that'll make it to le blog later this week! Armed with my sweets, I set off to pick up my friend Steff and head into DC. Upon arriving at Steff's apartment, I texted her to let her know I was outside. S - Ugh sorry my power went out, I need to walk down 21 flights of stairs. ^^That, my friends, is the sign that a girl needs a truffle and a cookie and a margarita or like 5. Luckily, we had all of the above! We had a little pregame cocktail hour, then set out for the main show, where Matt's friend Andrew had a spread for the ages: chili and fixins, cornbread, buffalo chicken dip, and GUAC. So much guac. Hence me eating a full avocado, but like let's move on, shall we? By the time we had been sufficiently wow'ed by Lady Gaga's acrobatic skills and the Falcons' astonishing lead, it was time for dessert. We broke out the truffles, and guys - everyone was like, pleasure-rolling their eyes and screaming "ermagerd what is this OMG!!!" So, if you want - um, that - to happen, the recipe is below. Begin by bringing you coconut milk almost to a boil, so it's hot but not scalding. I used the microwave for this, but you can also do it over the stove. Pour the hot coconut milk over the chocolate chips, cover with plastic wrap, and let sit for 5 minutes. Once 5 minutes is up, the coconut milk will have melted the chocolate. Stir the mixture together to form this creamy ganache. It may seem like it's not going to come together, but just keep stirring! Everything will be fine. Refrigerate this ganache mixture for 1-2 hours to let it set, and go like, do yoga or something to offset the massive amount of chocolate and beer and everything else you're about to consume. Once our mixture is chilled and almost solid, scoop 2-teaspoon sized balls of chocolate into your palm, roll them into a ball, and roll lightly in cocoa powder (or coconut, or crushed pecans, or anything that suits your fancy!). Once you're done, you can either refrigerate or keep them at room temperature before eating. That's it! I hope you make these ASAP because they're stupid simple and so delicious. Happy eating! NOTE: If you're not vegan, feel free to swap in regular chocolate chips and use heavy cream instead of coconut milk.